Benetech’s mission is to serve communities in need by creating scalable technology solutions. As the operator of Bookshare, we are working diligently to extend our reach across borders to the international community. While technological breakthroughs are creating new opportunities and lowering barriers for society as aTerry Jenna with project team members in India whole, the sad truth is that millions of individuals with disabilities around the world are still left behind. This is a particular reality for students in the developing world who cannot read traditional books due to blindness and other print disabilities. They grapple with formidable challenges as they attempt to pursue education in the midst of a widespread book famine. This is especially true in countries with several regional languages, such as India, where classrooms lack accessible reading materials that would allow these students to learn like their peers without disabilities. Nearly a year ago, Benetech set out to address this challenge with the support of a grant from USAID, World Vision, and the Australian government. The grant, under the three partners’ All Children Reading: A Grand Challenge for Development competition, funds our winning project to provide Indian students who are blind with mother tongue instruction and reading materials through Bookshare. I am delighted to report that we are quickly moving ahead with this project. Let me briefly describe this innovation and provide an update on our progress. 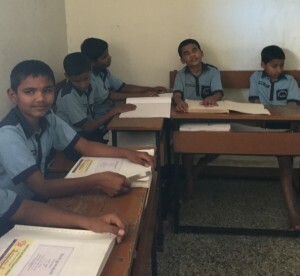 Thanks to the All Children Reading grant, we are developing a pilot project to provide accessible educational content for primary school students who are blind in Pune, India, where we will be able to capitalize on several existing Bookshare partnerships. 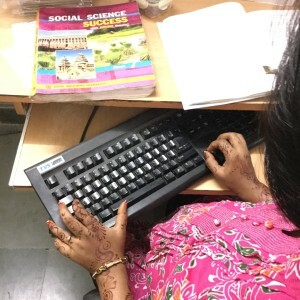 We are applying a targeted literacy pedagogy that pairs braille reading with human-narrated audio content in Marathi, which is the primary spoken language in the Maharashtra region. Our goal is to pilot this new audio capability with students at three schools for the blind, thus offering them age-appropriate, high-interest books in their mother tongue in both human-narrated audio and hard copy braille. 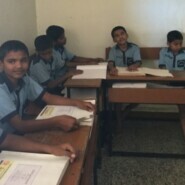 Young boys with visual impairments sitting at desks in a classroom in India in IndiaI recently traveled to Pune where we held workshops with project members, focusing on team building and creating cost-effective strategies to promote our project including a Bookshare drive to increase local language content and a plan for expanding relationships with publishers in Hindi, Tamil, and other regional languages. One important aspect of the project is that we are complementing the provision of accessible educational content with training on assistive technology and Bookshare services for teachers, administrators, and parents in our target region. Teachers and administrators for first through third grade students recently attended a workshop on these topics led by Mr. Nirmal Verma, a specialist in visual impairment teaching methodology. In the meantime, Benetech’s engineering and product teams have been adding Marathi human-narrated audio capabilities to Bookshare, and the collection development team has been increasing the offerings of Marathi human-narrated audio books, with the government of Goa providing the latest additions. We are also adding books in Hindi to the Bookshare collection. Finally, in order to measure the benefits of our project and improvement in the reading scores of target students, we are working with School-to-School International—a prominent global monitoring and evaluation organization—on implementing a rigorous evaluation plan. This month, our partners will conduct baseline testing on 135 students in our three target schools. We are looking forward to carrying out the subsequent phases of this project with our funders and Adult student in India reading an accessible ebook on a computerpartners. Benetech and the Bookshare team are excited to leverage a multimodal approach to help students develop early reading skills. We believe that the delivery of accessible educational content, when combined with teacher training and parent outreach, is the best approach to address the massive lack of accessible educational materials that so many individuals with disabilities still face. Moreover, this project is poised to demonstrate how the availability of accessible educational content in the students’ mother tongue impacts academic outcomes for students who are blind, and will inform our plans as we seek to replicate this work on a larger scale and in other countries. I hope you join in our efforts to empower individuals with disabilities around the world to improve their lives. I invite you to learn more about Benetech’s work to extend access to books and information to all people who need our services, regardless of where they live. Because inclusion matters.